Buy it now or bid instantly. New or used, we process your purchases with ease. Login, check out and wait for the mailman. Shop around the world, Bid on an auction or Buy It Now. Pay with PayPal without sharing your financial information with the seller. Free your mind, your purchase is on its way! Keep track of what you want. 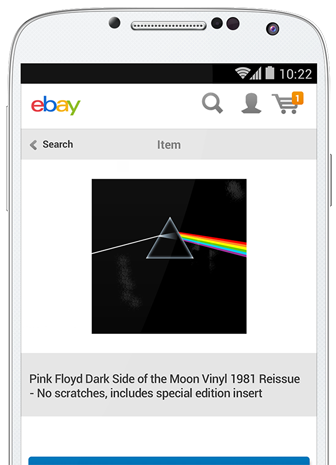 eBay is now the one place to collect all your collections, share them and scope out others. Buy, sell or simply browse and compare as much as you want. Shop with peace of mind, knowing we protect your eligible purchases. If an eligible item doesn’t show up, or turns out to be different than described, we’ll help sort things out with the seller. Conditions apply. Add a card to your account and simply login with your email address and password whenever you're buying something online. "PayPal makes shopping convenient, and gives me the confidence to buy on eBay even when I don’t know the seller." No matter what currency you prefer, you can buy from millions of sellers around the world. We accept 25 currencies from 202 countries and markets. Currency conversion fees may apply. The world's online marketplace is now open, for you. We bring buyers and sellers together, reducing steps, costs, and chaos. 1 1 pair of shoes is sold every 23 seconds on eBay. When you purchase with PayPal there are no hidden costs or processing fees, so you can enjoy your shopping. Fees apply when currency conversion is involved. Whatever it is - you can get it.